Since none of our stuff has arrived from China, we have been living out of suite cases for over 2 months. That is 9 weeks of the same clothes, a pack-n-play bed for Carter and the same toys/books. Yes, we've been keeping busy and having a blast, but today was slow morning and we needed some At-Home-Fun!! We resorted to our "go-to," which is Play Dough!! 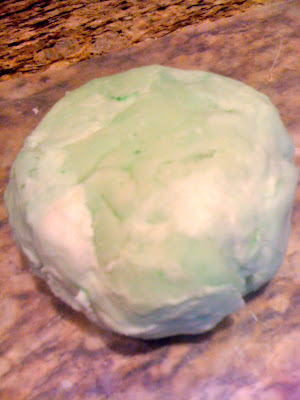 If you have any basic baking ingredients in your pantry, then you have what it takes to make play dough. There are so many recipes out there. A quick google search will have you up to your eyeballs in options. I decided to try Teacher Tom's recipe? Have you checked out his blog yet? I know I've mentioned him before...he's a pretty cool teacher! Well, this is the recipe he learned from his mom and uses in his classroom. 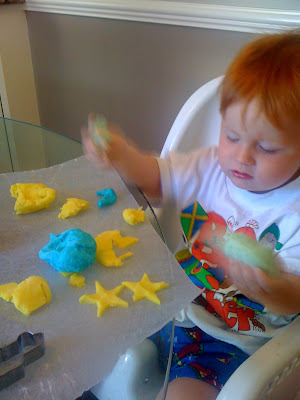 I have to admit....this is by far the best play dough recipe I've tried! 1. 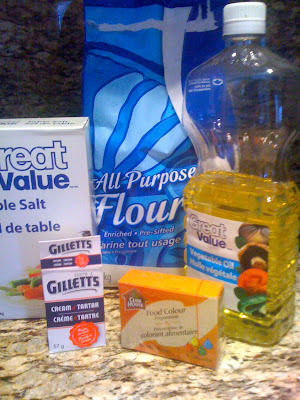 Dump the above ingredients into a pot. 2. Stir on Medium heat for approximately 1-2 minutes! 3. Plop onto your wax paper and cool for about 5 minutes. Done! Okay, lets observe these three blobs. The Green was my sacrificial first batch. 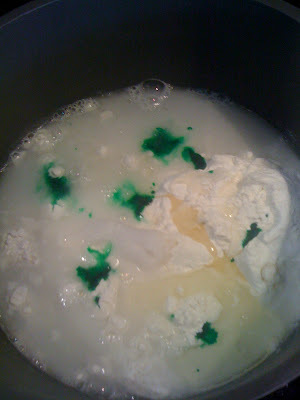 I only used 7 drops of food coloring...not good. Blue was about 30 and Yellow I squeezed about half of the bottle. Here is Carter working his play dough, first thing in the morning. The kids and I made this play dough today. They loved it. I doubled the recipe and it came out perfect. We made red dough since we are learning the color red this week. I used almost an entire (small) bottle of red food coloring to get the color perfect but it worked great. This will be one of our weekly projects. Creating a different color each week. Thanks for the recipe. What a great idea, thank you! They look kind of like little cookies. Makes me a bit hungry but I'm def. going to give this a try. It's a great way to let them practice their motor skills.